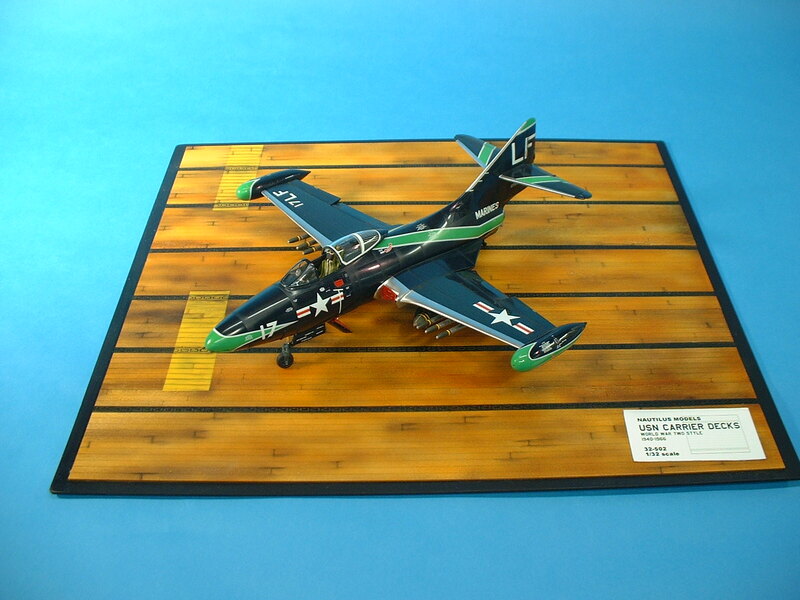 The recommended color for a WW2 deck is Testors Model Master #1719 Insignia Blue (FS35044). The deck striping, if you choose to do any, should be done with Model masters #1741 Dark Ghost Grey (FS36320). While these colors are not an exact match for Flight Deck Stain 21 & 22, they do come close and the overall effect looks good. The recommended color for a Prewar or Korean War deck is Testors Model Master #2100 RAL8002 Signalbraun. This color is the closest match I can find to the brown deck stain based on photographs and I make no guarantees about the accuracy of this color. The deck striping, if you choose to do any, should be done with Model Master #1708 Insignia Yellow (FS35381). The recommended color for a "Vietnam War" era deck (beginning in about 1960) is Testors Model Master #1740 Dark Gull Grey (FS36231). The deck striping, if you choose to do any, should be done with either Model Master #1745 Insignia White or #1708 Insignia Yellow (FS35381). The landing stripe area is painted Model Master #2034 Engine Grey (FS36076). Photos seem to indicate the angled-deck Essex class carriers retained this style of deck until their FRAM (SCB-144) updates in the early 1960s. The unmodified straight-deck Essex units which served as CVSs, CVTs, LPHs and AVTs retained this style of deck until their scrapping. Our new 1/18th scale deck sections are designed to provide a realistic display base for the growing line of airplanes available from 21st Centruy Toys. Each kit consists of seven deck sections and will assemble to be approximately 24" x 22" in dimension.